For its 2008-2009 touring repertory, the Acting Company co-produced Shakespeare’s Henry V with the Guthrie Theater. The tour included a performance at the George Mason University Center for the Arts April 25. The performance at George Mason had merit, and deserves strong, constructive criticism. It could have been much better. The Acting Company, which has included a Shakespeare production in almost all of its 36 seasons, has a special mission. It describes itself as promoting “theater and literacy by bringing a touring repertory of classical productions, talented young actors, and teaching artists into communities across America, particularly those where live performance and theater arts education are limited or non-existent. Peforming each year in over 50 cities to audiences of 70,000 and reaching more than 25,000 students with its arts education programs, The Acting Company develops the best young American actors by giving them an opportunity to practice their craft in a reportory of classic plays and new works... [and] educates middle and high school students in under-served and disadvantaged communities.” This makes the Acting Company a national asset. In Henry V, Shakespeare selectively follows the framework of historical developments. The historical Henry V (reigned 1413 to 1422) claimed the throne of France, as had his predecessors going back to Edward III. 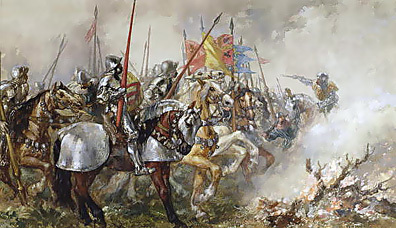 Henry crushed the French at Agincourt (1415). Moreover, to all appearances at the time, he put an end to the long-running contest for the French throne that we know as the Hundred Years’ War, by compelling Charles VI, King of France, to sign the Treaty of Troyes (1420). It specified that Charles would give his daughter Katherine to Henry in marriage, and that on Charles’ death, Henry and his heirs would inherit France. Under the treaty, therefore, Charles’ son, the dauphin, became a virtual nobody. Henry and Catherine were duly married. 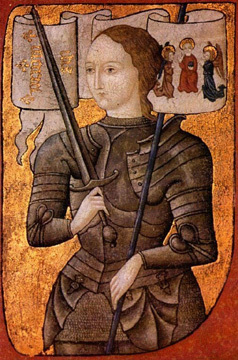 Of course—beyond the scope of the play—the entire scheme unravelled after Henry’s death, with the decisive help of Joan of Arc, who took the field in 1428. What did Shakespeare actually do with his historical material? Shakespeare played out the theme of England’s famed conquest at Agincourt, but—being Shakespeare—he did more. He created a running irony between the ostensibly great, noble cause, and the corruption, ugliness, and injustice of war. The play begins with a demonstration of the Church’s support for the war from corrupt motives. The Archbishop of Canterbury tells the Bishop of Ely that he has just offered the King a large sum of Church money for the war, in order to buy his support against an attempt in Parliament to divest the Church of extensive properties. (By the time Shakespeare wrote the play in 1599—decades after the Protestant Reformation in England—most of the audience would have looked upon such a divestiture of the “Papists” with favor, and Canterbury’s deal as corrupt.) In the fighting in France, Henry is shown ordering the killing of all prisoners, contrary to the law of war. Shortly thereafter, Henry speaks again of killing prisoners, out of sheer cruelty, to terrorize the French. The actions of lesser figures are similarly shown as often derived from a base alloy. This irony throughout—of the ostensibly noble that is intertwined with the base—is the play’s heart and soul. A performance that does not draw this irony out, is necessarily flat. The performance suffered from this shortcoming. Canterbury and Ely (Andy Grotelueschen and Robert Michael McClure) discussed the corrupt transaction almost drily. If they had appeared more sly, more gloating, more conspiratorial, their voices could have been heard more distinctly in Shakespeare’s counterpoint. When Henry (Matthew Amendt) orders the killing of the French prisoners, some sign of surprise and hesitation is called for, but instead, one of the prisoners is killed on stage without hesitation, in an entirely perfunctory manner. In a new scene, Fluellen (William Sturdivant) then announces that the French had, just before, committed a similar violation and condemns that act: “Kill the poys [boys] and the luggage? ’Tis expressly against the law of arms; ’tis as arrant a piece of knavery, mark you now, as can be offert—in your conscience, now, is it not?” Again, the words are not enough: There must also be emotion—a pause, a faltering delivery of the words, with an expression of disbelief. Gower (Robert Michael McClure) thinks Henry’s order justified by the preceding French atrocity, and declares, “O, ’tis a gallant king!” Silence is needed after that line, to produce thought in the minds of the audience! That silence will also prepare the audience for the rich dialogue that follows, in which Fluellen refutes Gower. Fluellen develops a case against Henry because he turned out his friend, Sir John Falstaff. We have already been exposed in Act 2 to the view that this rejection was such a blow that it caused Sir John’s death. Fluellen’s case can also cause the audience to think again about whether Henry’s order to kill the French prisoners was indeed justified. Fluellen is very oblique and ironic (after all, he is criticizing the king), but his subtle message comes across. This passage must be delivered more slowly and with greater deliberation than it was in this performance. The back and forth is not banter. Apart from the handling of the theme of the brutishness of war, there were also other problems of appropriate modulation of emotion. Beginning in Act 1, Henry shouts his lines to convey the emotion of “onward to battle!” However, the shouting goes on and on, as if there could be no other emotions in the circumstances of the action. Finally, in Act 3 Henry delivers his gruesome threats to the people of Harfleur, before the town walls, to induce them to surrender. Here, Henry speaks very softly. (Relief!) But the emotion of calmly cruel calculation is missing. He might as well having been reciting the Lord’s Prayer. In Henry’s one-sided dalliance with Katherine (Kelley Curran) in the last act, a crucial subtlety is again missing. Katherine resists Henry’s advances throughout. She takes her stand on the ground that it is up to her father, the King of France, whether she will accept him or not. But the scene concludes with Henry kissing her (Shakespeare’s stage direction). How should this be played? It could a unilateral kiss. Or, it could be an extended kiss that begins unilaterally, with Kate eventually responding (the kiss making its own case, as it were). In this performance, Katherine did respond; however, the nuance of a kiss that begins in one way and ends in another, was missing. Instead, Kate immediately responds warmly to Henry’s kiss, inexplicably, in light of the preceding dialogue. The great divide in Shakespearean performance today is between those productions that attempt to convey the art and thought of Shakespeare, and those that attempt to take the soul out of Shakespeare and leave a corpse. For the sponsors of the latter, Shakespeare, like Schiller, is dangerous, because his work provokes, uplifts, and enriches the thought processes of the audience. This production, even with its flaws, was on the side of humanity. The Folger Shakespeare Theatre, a national institution with far more prestige than the Acting Company or the Guthrie Theater, is a leading example of the anti-Shakespeare movement. This reviewer witnessed a Folger performance of Macbeth a few years ago in which the setting was a small town in Louisiana, and the actors were local criminals dressed in zoot-suits, sometimes growling their lines into the telephone. But Shakespeare’s great theme—in Macbeth and elsewhere—is statecraft. The Folger performance was designed to obliterate that theme by relocating the action to the small-town scale. The rest can be left to the reader’s imagination. In a subsequent discussion with a member of the Folger staff, it became clear that the Folger was dedicated to the reduction of Shakespeare to soap opera trash. By comparison, an honest performance, with weaknesses, is as silver that could be transmuted into gold. Shakespeare’s ironic theme of glorious/inglorious war runs throughout the play. Readers may object that it would seem a strange thing for a dramatist of the Elizabethan era to write in an anti-war vein. It was, after all, also the era of Francis Drake and Walter Raleigh, and opposition to war as such was the product of a later age. Be reassured. Shakespeare did not write plays primarily to make this or that statement. And there is no anachronism here. It would therefore be doubly wrong to interpret the play as a categorical statement against all war, as some have tried to do. Shakespeare wrote Henry V for the ages, on the theme that wars are fought for mixed motives and at a high human price. But he wrote in 1599, in a specific political context, and to provoke thought on the play’s dialogue at that moment. In 1599, England had been at war with Catholic Spain for years. In actual warfare, the high-point had been the launching of the Spanish Armada in 1588, ostensibly to reconquer England for the Roman Church. The Armada was utterly destroyed en route in a storm, but for years thereafter, England expected a new attempt. Well before 1599, however, Elizabeth’s first minister William Cecil, his son and successor Robert Cecil, and Elizabeth herself were determined to achieve a treaty of peace for fiscal reasons, because Spain was no longer a great threat. However, a royal favorite, the Earl of Essex, stood for active, “patriotic” war against Spain, and the government feared his potential to rally large sections of the population to his side. 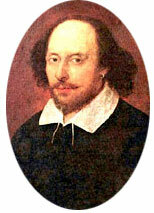 Shakespeare saw the merit of cultivating the thought processes of his countrymen with respect to the meaning of Essex’s war drums. His play must have had a particularly strong effect on the lower social orders, who were enabled to consider that they suffer the most in war. This is an unusual device for Shakespeare, but is readily understood in the political and policy context of 1599. Shakespeare wrote a play for all time. In composing a dramatic counterpoint on the nature of war, he also addressed the need of the moment. Thanks to the Acting Company and the Guthrie Theater for bringing it to the American people!